My art residency at Proyecto’Ace ended on February 13th and the second residency at Museo de Arte Moderno in Chiloé starts March 8th. Since historically I’ve always made my best decisions at 3 am on some random weeknight, I purchased a last minute plane ticket to Ushuaia, the southernmost city of South America. This was to be the start of my exploration of Patagonia. 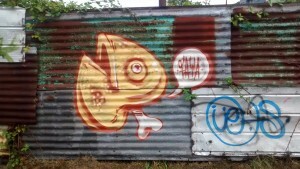 I left Buenos Aires at the wee hour of 5 am, February 16th, and opted to stay awake through the night to catch a taxi. The airport kindly sent my backpack to another city, and though they said I would get it back by 5 pm the same day, I knew there was no way this would happen. There has to be a moral lesson in there somewhere, when you find yourself as far south as you can go without hitting Antartica, with nothing but a purse and the clothes on your back. At any rate, this event didn’t keep me from enjoying what the city had to offer in terms of adult beverages or day hikes. I was only planning on being in Ushuaia for three days, but waited for my luggage to be rerouted to me before purchasing a departing bus ticket, thereby extending my stay to five nights. During this time, I probably slept no more than 20 hours over a span of five days, but I had an absolute blast in this gimmicky, touristy, inevitably charming city, nestled amidst mountains and lakes, and so close to the dream of Antarctica that some who travel to this point will fulfill. By the time I write this post, three of my fellow travelers will have taken a polar plunge more epic and awful than I can conceptualize. 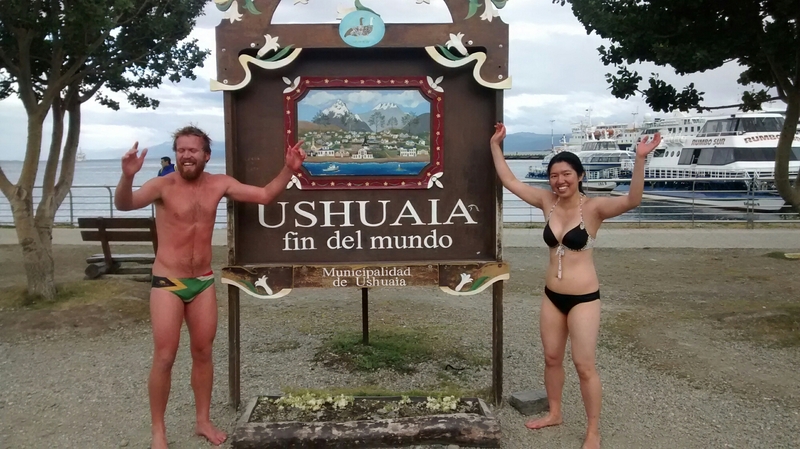 This year, at least, I had to settle for a milder New Year’s plunge in Ushuaia. I’ll still take it. My hostel had an amazing mix of great company. Pretty much anyone who decides to go to the so-called “end of the world” has a good story for the journey that led them there. Motorcyclists from as far as Alaska, Australia, Switzerland. A bicyclist from Minnesota. 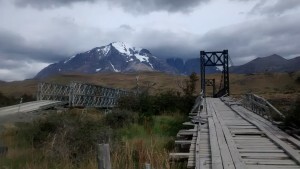 Three of us went on an epic 36 kilometer hike in Tierra del Fuego. 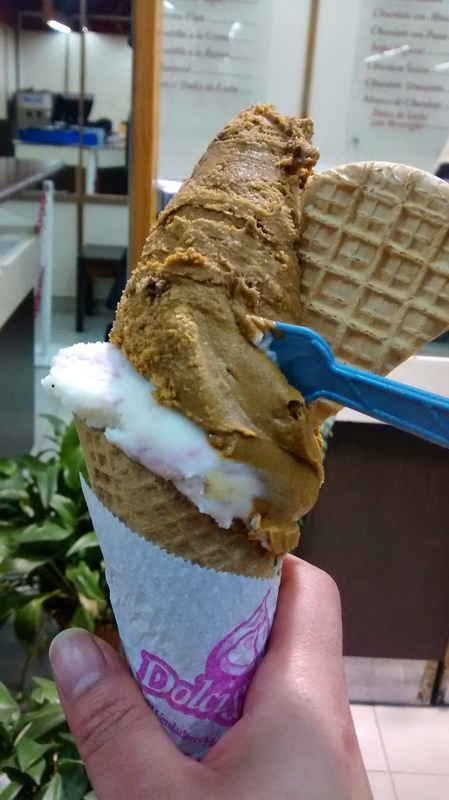 Two cheeseburgers with fried eggs and a double scoop cucurucho of gelato never tasted so good as after that hike. I love meeting other travelers and finding out what brought them here. So far, it seems there are two types. Those who get in tune with the pulse of the places they visit and those who don’t. I hope I am in the former group. A lot of people back home were surprised when I quit my job last August, but it’s the last thing to make me unique in Patagonia. It seems like most of the people I’ve met on this trip quit their jobs to travel, some for as long as two years, and often with a far more nonchalant attitude about it than I’ve had. They left their former lives behind without “bookends” to neatly contain their trips, whereas I left knowing full well when my return flight will be. My two months abroad slip away too quickly, though it’s not so much the lifestyle of “perpetual” travel that appeals to me as the mindset required of those who choose to pursue it. A willingness to take action on an idea that sounds impossible or risky to those who haven’t done it. A sense of values that’s not attached to a job title or an oversized ego. A hunger for new challenges, not for glory, not for gain, but for the sake of self improvement. A lifestyle that consistently trumps any danger of analysis paralysis. The knowledge that true comfort and stability come from within, not from jobs, possessions, or reputation. The ability to not need a plan, and not be lost without one, either. Of course, for every feeling, there is its opposite, often generated by the same source, within a shared moment. 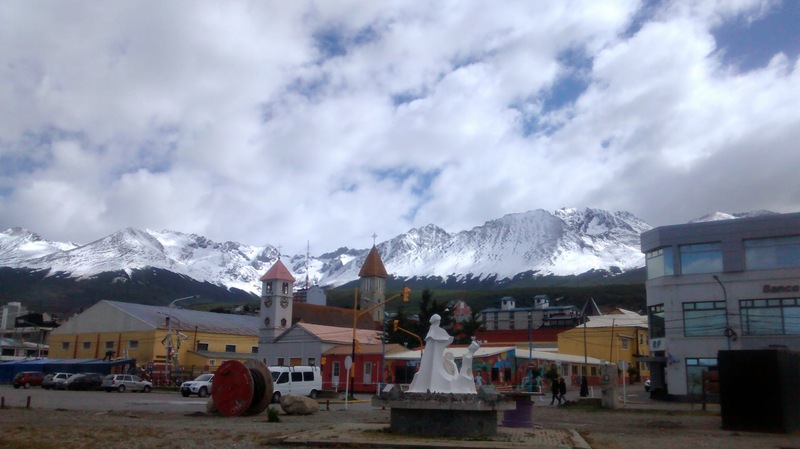 Suddenly while in Ushuaia, I felt so distant from any attachment, any responsibility, that I ceased to know what exactly I’m returning home for. I don’t feel quite so removed anymore, but I also know that my sense of home has altered in an irreversible way. I have been between many things on this trip. I am always excited to go to a new place and meet new people, sad to always be leaving. I have had deeply satisfying experiences here, backlit by a sense of longing for something I can’t quite identify. And because I do have a return ticket booked for the end of March, I can’t help but feel anxious about returning. The price of having a home to return to is feeling the obligation to return to some thing; to know what I want at least on paper; to have a clean, simple answer that’s easy to summarize, package, and deliver to other people, with no room for misinterpretation, and therefore no risk of inviting questions or judgment. Yet… I have never felt more at home than by not having a home, never felt more purposeful in my actions than by doing rather than planning. I get tired of eating ham and cheese sandwiches. I’ve eaten enough white bread and crackers to annihilate the entire paleo population. I thought the U.S. had a sugar problem until I traveled to South America. The corruption and problems are not concealed here like they are in the States. It’s not a sheltered place, but maybe then it’s also more real. I don’t doubt that it will be good for me to return home in ways I have yet to anticipate. Inasmuch as it matters to listen to your intuition, you must also be capable of countering it.